Synthite Industries Limited has bagged the prestigious “Strong commitment to HR excellence Award” of the 6th National CII HR Excellence Award instituted by Confederation of Indian Industries. The award was received by Mr. Ninan Philip, Director Human Resources & Mr. Rajesh Kumar M R , Vice President- HR at the HR excellence conclave held at Delhi on 19th February. Mr. V. S Oberoi, Secretary of higher education, Ministry of HRD, Government of India presented the award. 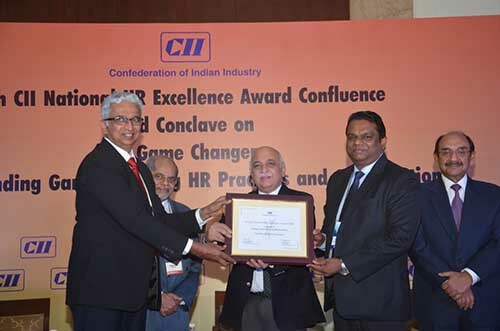 The HR excellence award of CII, with a well-crafted evaluation model aims to recognize organizations which demonstrate sustained commitment and excellence in Human Resource practices. The award was presented after a thorough scrutiny and assessment of the various facets of Human resources at Synthite including and not limited to leadership’s commitment to human resources, HR strategy, Learning & Development, Employee engagement, HR Processes & the Results emanating from all these areas.